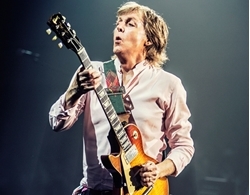 Paul McCartney is livestreaming a 'secret' gig on YouTube Friday to coincide with new album . Beatles Radio: The Beatles, Solos, Covers, Birthdays, News The Fab 4 and More! To coincide with the release of his new album Egypt Station tomorrow, former Beatle Paul McCartney has been teasing details on social media of a “secret” gig he’s planning in New York City that’s set for tomorrow night. In keeping with a kind of freewheeling experimentation with technology that’s characterized his later years and recent releases, from toying with VR to writing a one-off song that plays at the end of the Destiny video game, Macca is teaming up with YouTube to livestream the show worldwide. It’s being billed as a “YouTube Original” and is set for 8 p.m. eastern time.